You may know my feelings about Steiner/Waldorf Schools*. Most importantly, that prospective parents are not being told about the occult foundations of the Steiner philosophy. You may think that the mystical, spiritual and esoteric movement behind Steiner schools might be a very important factor in deciding whether your children should attend such a school. But the schools obviously do not. Informed choice is not possible when you do not understand the school’s underlying philosophy. As the current coalition government appear to be very keen to allow Steiner Schools to open under the Free School programme, I wrote to my Lib Dem MP for Wells, Tessa Munt, with my concerns. Her constituency will overlap with the catchment area for the first Steiner School opened under the scheme, in the Somerset town of Frome. So, it would appear that I am mistaken to be concerned. So, let me recount my concerns. You may then come to your own conclusions. Rudolf Steiner was a central figure of the occult revival at the start of the 20th Century. He believed he had access to a higher consciousness through a clairvoyant knowledge of the spiritual world. After splitting with Madame Blavatsky and Annie Besant, he took the German speaking theosophists and set up his own spiritual esoteric movement, Anthroposophy – the knowledge of man. Anthroposophy blended ideas from astrology, spiritualism, Rosicrucianism, Christian mysticism and other gnostic and esoteric sources, to create a cosmology based on Steiner’s readings of the ‘Akashic Records‘ – the cosmic history of the past and the future that exists on a spiritual plane and available to the few through meditation and clairvoyance. Thus was born Steiner’s Spiritual Science – his belief that ordinary science was really just a capability to be able to “spell”, but to be able to “read” one had to have knowledge of higher spiritual existences. Without such knowledge, we cannot fulfill our potential as fully spiritual beings. Steiner’s visions gave him insights into all areas of human life, including farming (biodynamics), art, dance, diet, architecture, biology, history, geology, finance, and, crucially for us here, medicine and education. These insights have led to thousands of anthroposophically inspired organisations including schools, farms, cosmetic and health companies (e.g Weleda), Banks, (e.g. Triodos) and spiritual communities (e.g. Camphill, Christian Community). In order to understand Anthroposophy and Spiritual Science, we need to understand the core and basic concepts of Steiner’s world view. Steiner saw the purpose of Anthroposophy was “spiritual advancement through karma and reincarnation, supplemented by the access to esoteric knowledge available to a privileged few.” It is worth remembering that sentence as it is absolutely vital in understanding Steiner-Waldorf Schools. We shall now look at those concepts in a bit more detail. Steiner viewed the spiritual world to be real and populated with many nature spirits, elementals and root spirits (gnomes). Steiner believed his clairvoyant techniques were a genuine scientific approaches to studying this spiritual realm. They were extra tools, not an alternative to science. We often see Steiner followers repeating the view that Steiner philosophy embraces and extends science. Of course, the reality is that science is undermined by the insistence of the reality of nonsense. This too is important in understanding Steiner Schools. At the heart of Anthroposophy is the belief that humans are composite beings made up of our bodies and a number of spiritual entities that can be reincarnated. Our spirits enter into bodies each lifetime in several stages as we grow. At about seven years the etheric body incarnates. This coincides with the appearance of adult teeth and gives “strength to learn”. At about fourteen years the astral body incarnates as puberty comes about. Finally, at 21 years, the I, or ego, the divine selfhood incarnates. The physical body that you are incarnated into will depend on karma. That is, the beneficial or harmful effects you have on the world will revisit you as you reincarnate and determine the sort of physical existence you have. Steiner believed there was a hierarchy of existence that souls could inhabit, driven by karma. Nearer the bottom of the spiritual hierarchy we can find animals such as fish and reptiles. Those animals with good karma will progress to become apes, Indians and finally Aryans – white and fair Germanic-Nordic humans. Steiner’s cosmology is inherently racist and abhorrent. Black people are spiritually childish. Jews should simply ‘disappear’. Disabled people somehow must have wanted to be disabled though actions in previous lives. Steiner viewed the purpose of Anthroposophy was to prevent the human race from degenerating towards a black-brown “denseness”. All of Steiner’s movement, whether agricultural, medical or educational, is designed to assist people through their current incarnation and into better future incarnations. Thus, the Camphill movement, helps disabled people overcome their karma so that they will not be so unfortunate in future lives. Steiner Schools are designed to assist the spirits to enter children’s bodies as they grow and to prepare their souls for better lives. We can view Steiner Schools not as educational establishments, but as places of spiritual midwifery. In the 1920’s and 30’s, Steiner’s worldview resonated well with the political zeitgeist in Germany and the movement grew significantly. 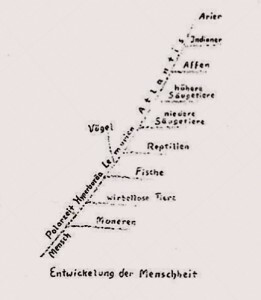 Anthroposophical agricultural practices were set up at Dachau by Himmler and medical supplies used for experiments supplied by the Steinerist Weleda company. (In more modern times, biodynamic agriculture is adopted in places such as the Duchy Home Farm at Highgrove where you can attend courses on how to please the elemental spirits whilst planting, through astrology, homeopathy and ritual.) Although currently presented as humanistic, Steiner’s philosophy is fascistic and reactionary. He recognised that amongst many people, the movements aims and beliefs would be seen as absurd and urged his followers to be coy. This entry was posted on February 14, 2015 by Amir Alwani. It was filed under education, esoteric, news, tyranny .